Barry Malzberg, one-of-a-kind SF author and respected SF historian, in a video which I highly recommend available at YouTube, talks about his favorite fifteen issues of Astounding. 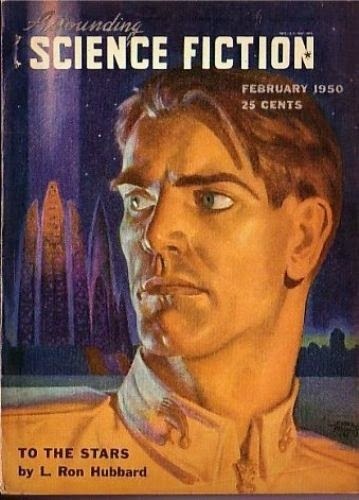 One of these is the February 1950 issue, which contained the first part of what Malzberg considers L. Ron Hubbard's best novel-length work, To The Stars. I got a hold of a 2004 hardcover edition of the novel, and read it yesterday; it's pretty short, like 200 pages in this edition but with large print and wide margins. To The Stars is about the Einsteinian time dilation effect we see in numerous science fiction books, like Heinlein's 1956 Time for the Stars and Haldeman's 1975 Forever War. If you fly in a space ship at a large fraction of the speed of light, then return to Earth, you will find that while maybe only a year or two has passed for you, on Earth much more time has passed, and maybe your little nephew is now twice your age or your whole society has gone through a political or cultural revolution and you don't fit in. At the start of To The Stars it is thousands of years in our future, and the solar system has a classbound society. The rich nobility live in skyscrapers and the masses of the poor lack social services and swarm down on the surface. Alan Corday is a young gentleman, highly educated, but his father has fallen into bankruptcy and our hero has no money to marry his girl or start his engineering business. He goes to the slums around the New Chicago spaceport, hoping to get passage to Mars, where he thinks he can get a job with the duke who runs Mars. But he gets shanghaied and impressed into the crew of a ship going to Alpha Centauri and Betelgeuse, one of the long haul ships subject to the Einsteinian time dilation effect. By the time he gets back his girl is going to be an old hag! Only desperate people with nothing to hold them on Earth crew these long haul spaceships, and now upper class Corday is trapped on a ship with a bunch of these lower class clods! The style of To The Stars is a little weak, but I like the plot, and the characters are simple but interesting. Hubbard portrays the ways the various members of the starship's crew deal with the stress of their bizarre lifestyle, which has them again and again landing on planets they left just a few months or years ago to find that decades or centuries of political, social, and technological change have taken place. They are men and women without countries, who often can't even talk to the natives when they return to their own home planets because pronunciation, spelling and grammar have changed, not to mention social and political attitudes. (When poor Corday gets back to Earth 60 years have passed and a revolution has occurred; everyone from his social class has been massacred and people are afraid to be seen with Corday because he is wearing old-fashioned clothes that they recognize from school text books as characteristic of the enemy class.) Their country is the ship, but does life have meaning or value when you live in a country of a few hundred people suffering stress disorders and regularly face terrible dangers? This book is much better than Hubbard's postapocalyptic The Final Blackout; To The Stars is a traditional SF story of guys flying around in a spaceship, solving problems with ingenuity and ray guns, trying to figure out their place in the universe. In some ways it reminds me of those early Heinlein novels in which a young man matures and learns responsibility while having adventures; I guess I'm thinking of Starman Jones and Citizen of the Galaxy, because so much of them takes place on space ships. Solidly entertaining: fans of classic rocket ship and ray gun adventures should check it out. "Barry Malzberg, one-of-a-kind SF author and respected SF historian" -- one gets the sense he isn't very much liked by the SF establishment as a whole.... His work + his scholarship (which essentially claims SF has failed). Maybe I should have said "controversial?" I don't necessarily agree with all of Malzberg's assessments (I don't think SF has "failed," though I guess it all depends on how you define success) but as the video I linked to, and the chapter of Engines of the Night available at the Library of America website shows, Malzberg has a vast store of knowledge about SF and brings a very personal, very sincere, point of view to the material, which I think is great.